The thing that really bothered me about this was that, even though it was a female lead, and a lesbian couple, it didn't feel that way. The lead was happy to let people think she was a man, she was the 'man' of the relationship, going out to work, protector type, while her partner was the 'woman' in the relationship, good with children, nurturing, damsel in distress type, when in reality it wouldn't be like that at all. Maybe some of it had to do with the culture it was set in, but that shouldn't change the way the narrative was done. I guess when I was told it would be a female, lesbian lead, I was expecting to read about a strong female character and it was disappointing to see that it wasn't any different than if she had just been a man. The characters fell a little flat and it was hard to relate to them. I also had a problem with the fact that it didn't feel like it was trying hard enough. It was a weak imitation of Aladdin, in that though it was set in the desert, the language and names felt a little off. Now that might be because of my own heritage, I thought maybe if you came from a different background, you wouldn't really pick up on it. Maybe because it was set in an alternate universe the author took some artistic liberties, but with everything else slotting into the Aladdin template, it seemed like these were out of place. Overall, I'd give this book 2 out of 5. It was an okay book, a light read, but not something I would recommend you go seek out. Adijan and her Genie does seem to meet with mixed reactions. We reviewed the book at an early stage of our running this blog, so we may have been less critical of what we were reading, in our sheer excitement over actually holding lesbian novels in our hands. 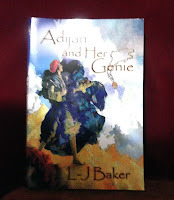 We enjoyed Adijan on the whole, particularly for its depiction of an established lesbian relationship, but as our guest reviewer's comments point out, there might be aspects of the book that won't work for all readers. To be fair to the book, it is clearly based on the general mythology of Arabian Nights, but never actually claims to be a carefully researched and accurate story (and there are hundreds of 'did not do the research' versions of Western historical and fantasy settings). On the other hand, there are issues of cultural appropriation, and expectations on the part of readers who may go "hurrah, an Arabic lesbian story!". It did other things well, so whether this will bother you or not is up to the reader.